WHERE HAVE I BEEN, I HAVE NO IDEA. Seth deployed, months have gone by and my head is spinning. I have TONS to blog about, and I’m very excited about that. 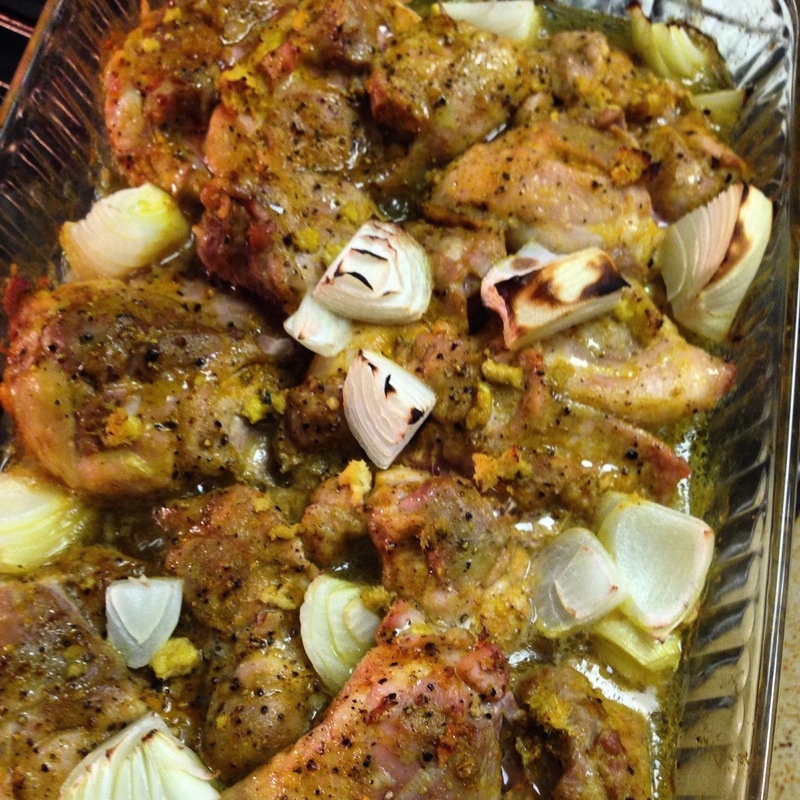 First, is this recipe I made a month or so ago, for ginger turmeric baked chicken. I’ve been working on adding more fresh and dried turmeric to my food choices, as it’s one of the most potent anti-inflammatory compounds available. 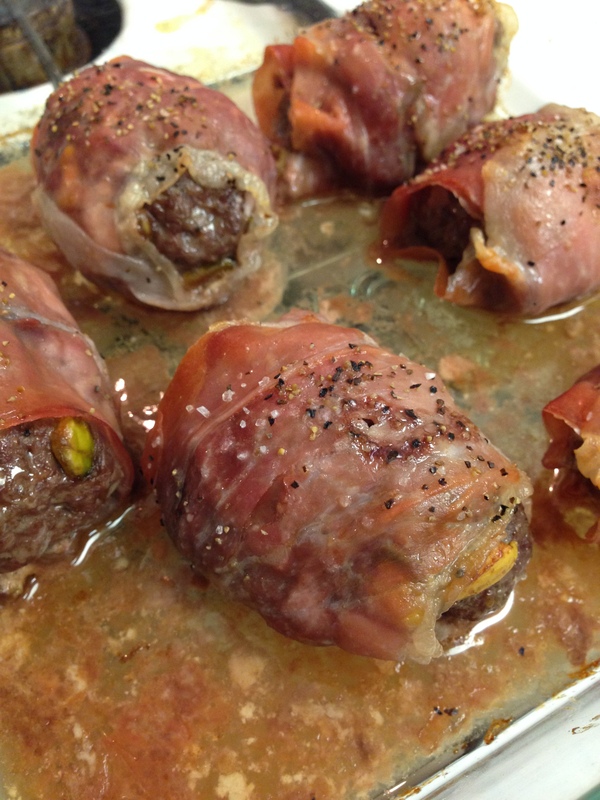 This recipe reminded me of a really good, cold weather, comfort food recipe. It was warm, satisfying and very fulfilling. Put all breasts in the rectangular glass baking dish. Slather each breast in ghee. 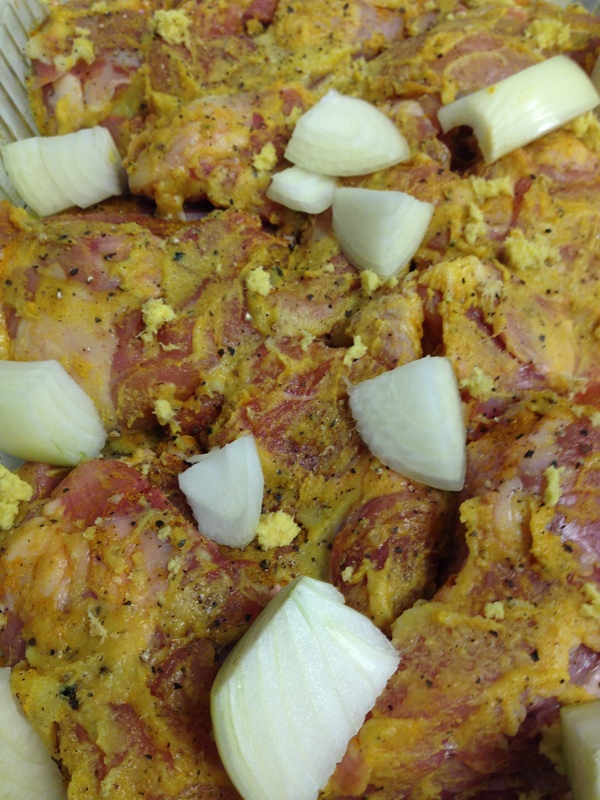 Generously sprinkle dried turmeric on each side, flipping after covering the first side. Grate fresh ginger directly over pan. Dash of salt and generous pepper. 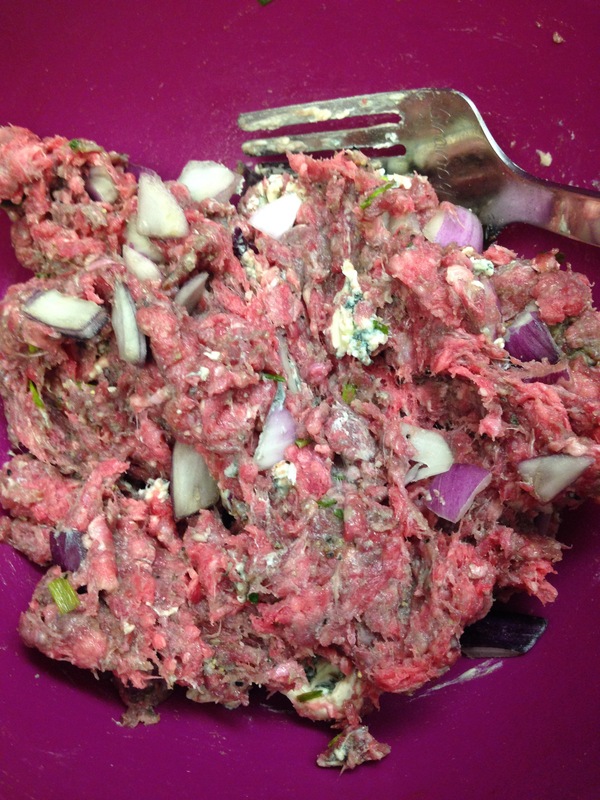 I loosely chopped 1 very large white onion into chunks, and just tossed it around the dish. Bake at 350 degrees, until internal temperature reaches 160, or your preferred temp. Reheats extremely well and your house will smell amazing! Several weeks ago my sister was talking about a dinner her and her boyfriend were having, which included prosciutto wrapped burgers. I thought, well damn, that sounds good! It had been on my mind ever since and I happened to have prosciutto, so I picked up some grassfed beef and decided to give it a whirl. Per usual I thought, hmmm, what else can I add? The result was fabulous. Put all ingredients except for prosciutto into a bowl and mix well with a granny fork (if you don’t have one, get one!). 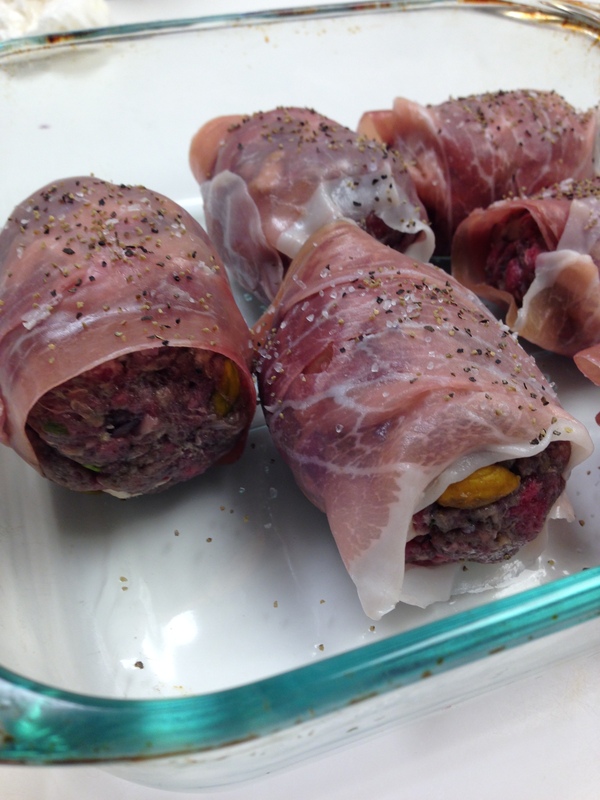 Form medium sized meatballs, and wrap each in prosciutto, placing each wrapped meatball in a glass pyrex baking dish. Sprinkle with salt and pepper on top. Bake at 350 degrees until done to your liking/temperature. The prosciutto crisps perfectly 🙂 Very easily made and a nice change-up from your typical dinner meat! I love mushrooms. All kinds. All of them. EAT ALL THE MUSHROOMS. Start by melting the butter in a saute pan, and then add the 2 portobello caps. 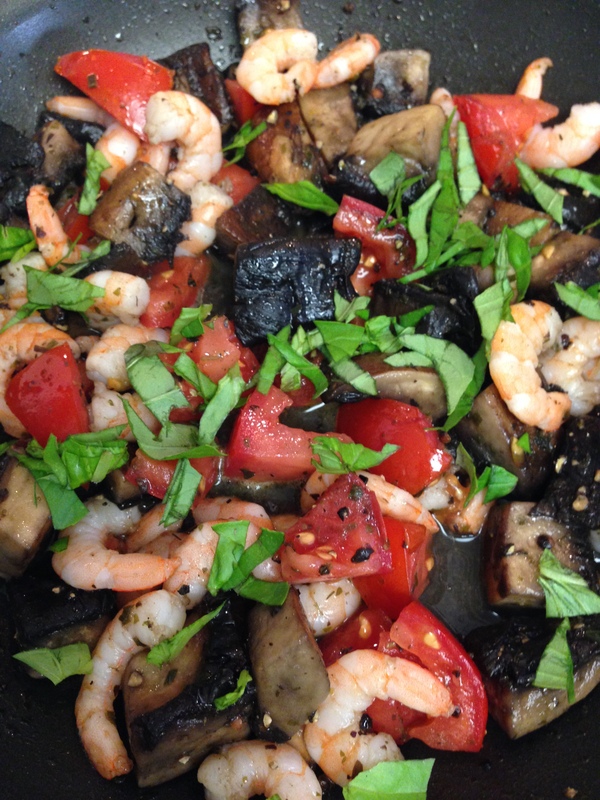 Continue sauteeing until mushrooms just start to soften and add the shrimp, tomato, fresh basil (cut up over the pan with shears) and generously grind sea salt/pepper over top. 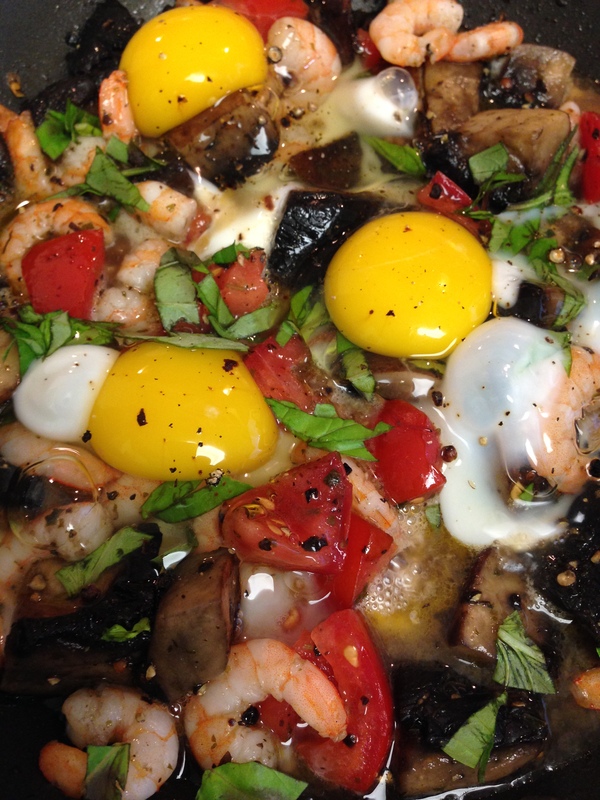 Continue sauteeing on medium until the added ingredients are warm. 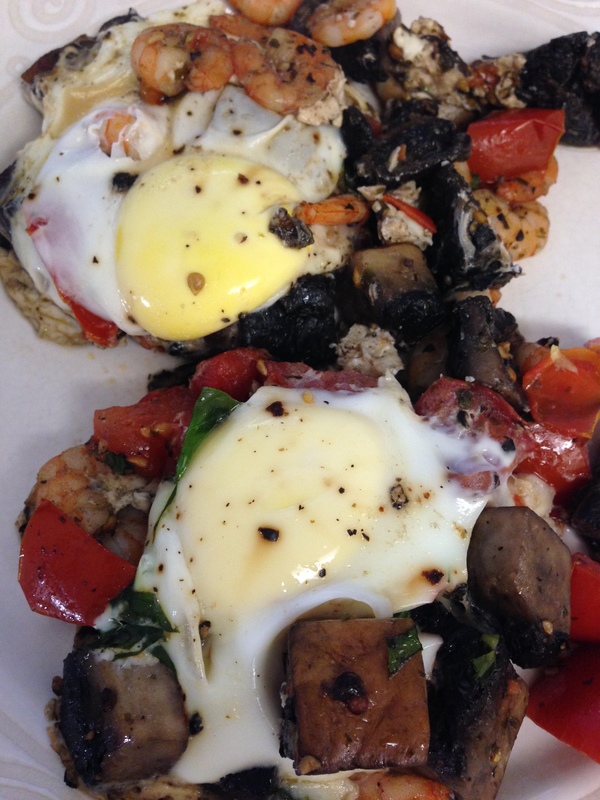 Crack the 3 eggs over top and place a lid over the pan. Let the eggs cook to your liking (mine were over medium). Should just call this “bomb chicken” because it is literally a taste explosion. 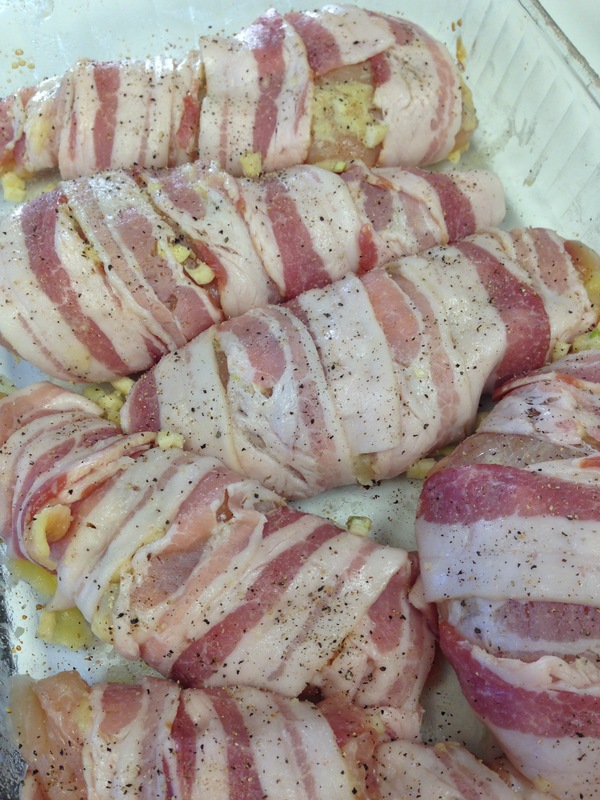 I had some really large chicken breasts that I split, slathered in ghee, generously sprinkled with Himalayan pink salt and fresh ground pepper, topped with chopped garlic, and then tightly wrapped in uncured bacon. I baked them at 375 degrees for about 40 minutes. 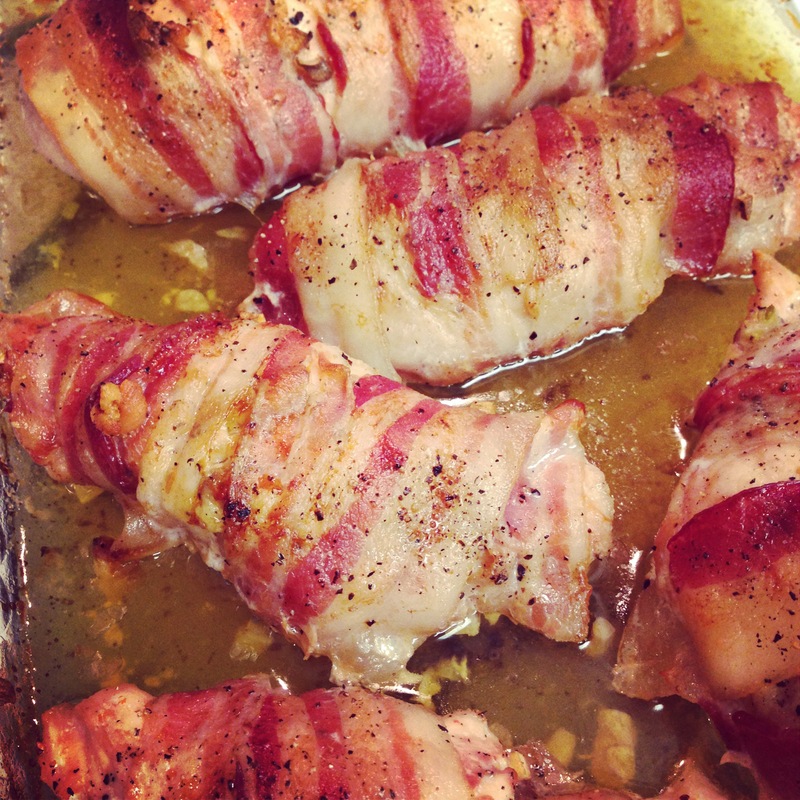 The internal temp was a little higher than what I was shooting for, but because they were slathered in ghee and wrapped in bacon, they were the juiciest chicken breasts I’ve had. And, chicken is my least fave meat. Perhaps not anymore. 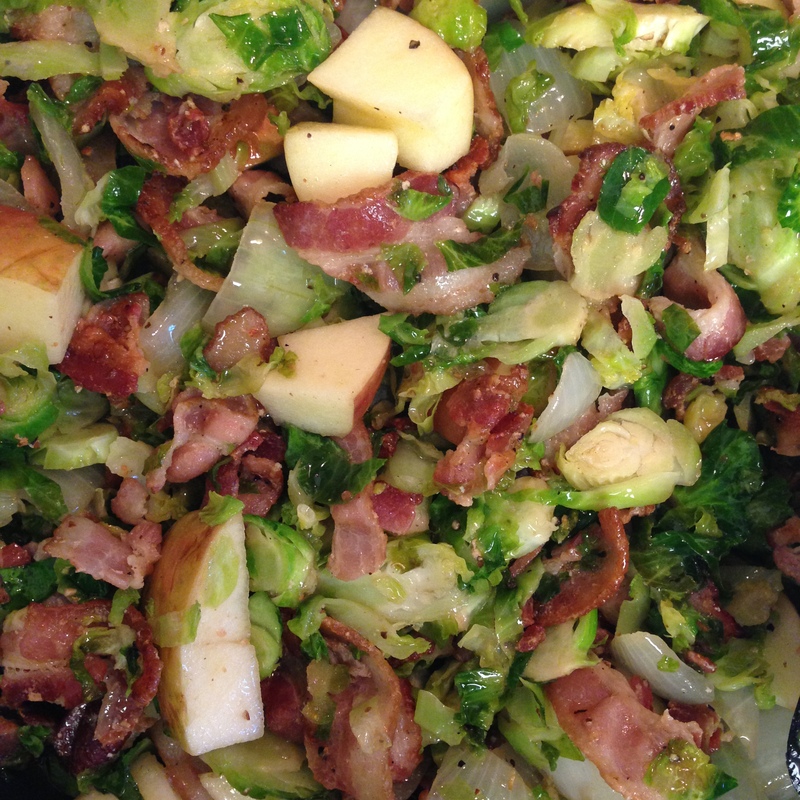 One of my favorite flavor combinations: bacon, Brussels sprouts, onion and apple. 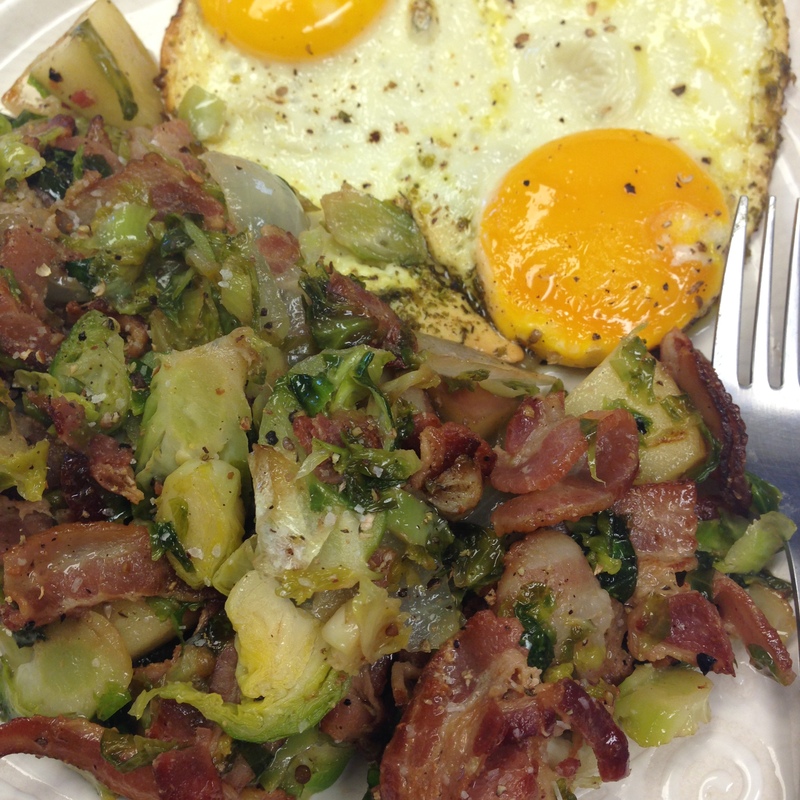 I could eat varying kinds of hashes all day long. Start cooking the ends and pieces in a deep sauté pan, continue cooking until bacon is cooked to your liking (I cooked a little longer because I prefer crispier bacon). Add the onion, and sprinkle with salt/pepp, continuing to sauté on med heat. 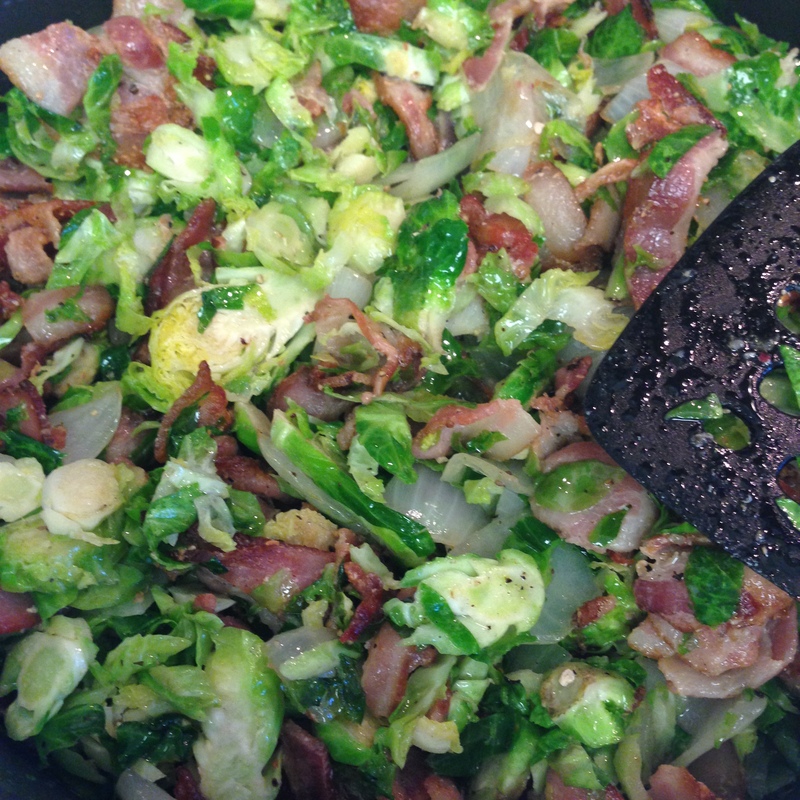 Once the onions start to turn transparent, add the entire bag of shredded sprouts and toss. Once the hash is almost entirely cooked, toss in the apple just to warm, so it doesn’t get mushy and turn to low heat. 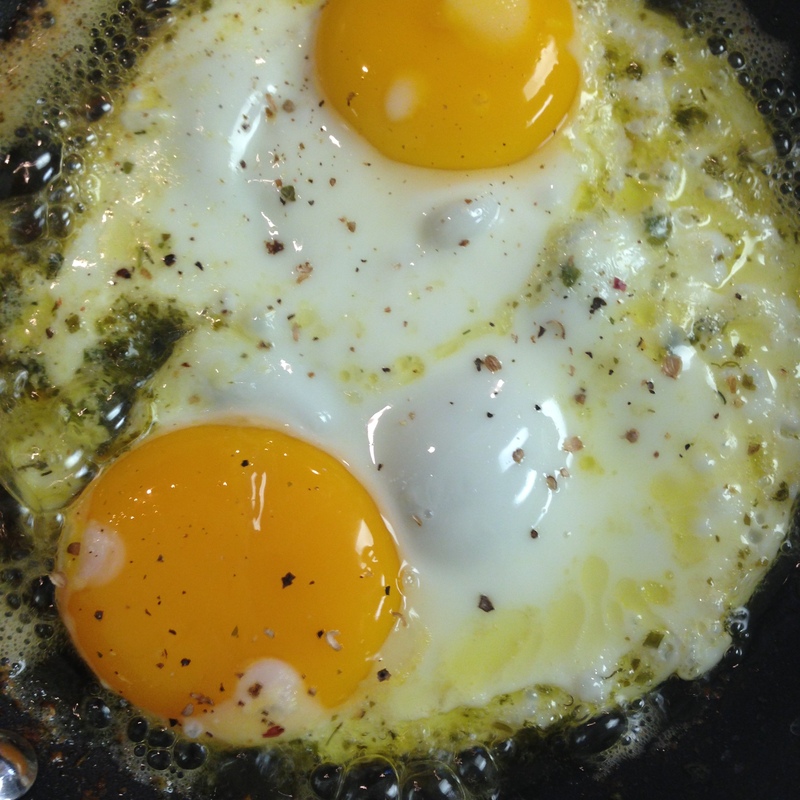 In a small sauté pan, melt a cube of grassfed garlic and herb butter, and crack two pastured eggs into the butter (LOOK AT THE COLOR OF THE YOLKS, OMG). Cook to your desired yolk texture. Pair with hash. Mmmm. Leftovers for lunch today!